If you have used Instagram, even for just a day, I’d be surprised if you haven’t come across the Instagram Explore page. If you’ve been looking at opportunities to increase exposure for your brand on Instagram, It’s not completely unlikely that you’ve been dreaming about getting your post featured on the Instagram explore page, either. Instagram continues to be an effective tool for brands to increase their exposure, and build strong relationships with their audience, and the statistics of Instagram marketing proves this. But as more and more people hop onto Instagram, including brands, it means that more and more content is being put out. In fact, over 95 million photos are shared on Instagram daily. This means that the competition of getting your post seen is tougher than ever. And this can be seen in the ever decreasing organic reach on Instagram. When the organic reach of your Instagram posts is decreasing, marketers need new ways to make Instagram work and to grant them marketing benefits. And those that think long enough will come up with the brilliant idea of trying to get featured on the Instagram Explore page. And that is the reason why you’re here. But getting featured on Instagram explore page is obviously easier said than done. However, by understanding what drives the explore page, you can significantly increase your chances of being featured there, and as a result get tons of exposure from your target audience and most valuable prospects. In this article, we’re getting to the bottom of the Instagram explore page in order to fully understand what drives it, so ultimately, we can get featured there and dramatically increase our reach. How does the Instagram Explore page work? The math behind the Instagram explore page is quite Interesting. 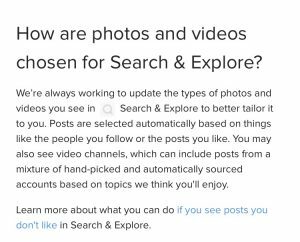 Because the truth is, posts on the explore page aren’t selected by random – nor does every single person on Instagram see the same posts. In other words, the posts you see are tailored to you. And by understanding how this is done is the foundation for being featured there, and taking advantage of all the benefits that come with it, such as followers, engagement, and ultimately conversions, as a result of the increased exposure. Because only then will you be able to “hack” the system. One might say that getting featured on the Instagram explore page is a free version of an Instagram ad because it increases your exposure so significantly. By now, I think you’ve understood that the Instagram explore page is driven by an algorithm. Just like the posts that you see in your news feed. So let’s look at the things that drive the algorithm and makes it choose what posts to feature there. Instagram has always had an explore page. But back in the days, it was called ”Popular page”. The only caveat though, was that the posts weren’t catered to suit the user. In other words, the posts featured there weren’t tailored to be relevant. The most popular posts on Instagram was what you saw there. And as a result, the Explore page never became as popular as popular as Instagram had hoped for. And Instagram eventually realized that the only way to make the page popular would be to make the content on the Explore page relevant to each individual user, not just show photos from Justin Bieber and Rihanna. As revealed by Instagram, we get to know that likes play a significant role in ranking on the explore page. This means that you need to put great attention to increasing the likes on your posts. Moreover, it’s clear that your followers also affect your explore page rankings. For instance, if you share a post, and then someone engages with it, meaning like it or leave a comment, it sends a signal to Instagram that they found that post interesting. And accordingly, you can expect that Instagram’s algorithm will take this into consideration when they present content on that person’s explore page. Further, your post will appear on the explore page of those people who engage with that person’s posts. As you can understand, a big part of getting featured on the explore page on Instagram is the network effect. Not only is does getting engagement on your post help you get your post featured in their feeds, but it can also help your posts make their way onto the explore page of the people who engage with the account that engaged with your post. As a result, you can expect that getting more engagement on your post will help you get a viral effect which quickly spreads to a ton of accounts. The more engagement you get on your post, the more people’s explore page your post will land on. This is also the reason why you normally see posts from accounts with a larger following on the explore than accounts with a smaller following. Note, however, that just because you don’t have a huge following doesn’t mean that you aren’t able to get featured on the explore page. In fact, you can get featured there with 10K, 1K, or even 500 followers. It’s just about satisfying the algorithm’s wants. And this is also thanks to the network effect. If you go to the explore page, the majority of the content presented there will be content that you find interesting. And the reason for this is obviously the fact that Instagram sees your engagements as a sign that you like a certain type of content from a certain type of accounts. Moreover, you can expect that a certain type of account follows other similar accounts within their niche, and this is why the network effect works so well as an explore page ranking factor, and presenting content that you like and find relevant. I’ve already revealed that getting featured on the Instagram explore page grants you tons of exposure. In other words, you get in front of your target audience which can lead to tons of marketing benefits. Not only do you get an increased engagement and followers, but you also increase your chances of driving marketing results that will benefit your business more concretely. Now, let’s look at how you can increase your chances of getting featured on the Instagram explore page and in front of your target audience. Based on the information we got from Instagram, we can use it to increase our chances of making our way to the explore page. Something you want to have in mind when doing this is relevance. How relevant is the content you post to your target audience? Moreover, you want to ask yourself what type of content they find appealing. Ultimately, what drives explore page spots is quality content that is relevant. If your audience likes a piece of content, they’ll like and engage with it. And when they do, Instagram gets an indication that people in your space like your content, and then, they might decide to showcase it to a larger audience. However, if they notice that your post gets a very low engagement, they see this as an indication that it wasn’t a very good post, and more importantly, that it wasn’t a very relevant post to the people in your audience. And accordingly, they don’t want to showcase posts that people don’t seem to like, on their explore page. If you’ve been sharing posts on Instagram, you have probably started to get an understanding of what type of posts your audience like, and what types of posts they dislike – or at least find less appealing. If you run a car-related account, you might have learned that your audience doesn’t resonate very well with photos of Fords, but they love photos of Lamborghinis. You might also have noticed that they prefer photos of Lamborghinis with crazy colors rather than in black. Also, remember that it isn’t just possible to get on the explore page with photos. You can also get there with a video. All of these things are worth considering when deciding what posts you should share. Because the better content you share, and the more tailored your content is to your audience, the higher engagement those posts will get, and ultimately, a higher chance of ending up on the explore page. Content is truly everything when it comes to the Instagram explore page. It’s not just enough to share the right type of content. You also want to pay attention to the times of which you share your posts. Your post might be amazing and perfectly tailored to your audience, but if no-one sees it, it will be hard to gain traction. Different from what most people say, I am going to say: forget about Googling the ”best time to post on Instagram”, because the truth is, it depends based on your audience. Moreover, the time of which you shared a post was much more important back in the days when the content you saw in your news feed was presented in a chronological order and not an algorithmic order like it is today. But that is not to say that the time of which you share your post is completely irrelevant. Although it isn’t equally important that you post at the exact time when your people log in to Instagram so that they see your post at the top, and ultimately engage with it, a ranking factor with the feed algorithm is still time. It’s just that it takes other factors into consideration as well. Since all accounts have a different audience, ”the ultimate time to post” will be different for everyone. To see when your audience is most active, you want to go to your Instagram Insights and tap ”followers”. In order to do this, you need to have converted your account to a so-called business account, if you haven’t already. Here, you’ll be able to see the days of the weeks when your audience is most active, as well as the days broken down into hours so you can go more in-depth. Instagram is the platform where hashtags have the biggest effect, compared to other social platforms. And hashtags are actually known to significantly increase the exposure and engagement on the posts you share. And when that happens, you know that you also increase the chances of getting featured on the explore page, as higher engagement equals a higher chance of getting there. This is why you want to use all approaches possible to increase your engagement (without buying engagement from fake accounts). And hashtags are one of them. In fact, according to a study by Simply Measured, posts with at least one hashtag average 12.6 percent more engagement than those without. Using hashtags is one of the easiest, if not the easiest way to increase your engagement on Instagram, so if you aren’t using them, you’re missing out. If you’re wondering how many you should use, I’ll answer all 30! Some studies have been made, in which some say that the ideal number of hashtags is 12, others say 5, and so on, but personally, after 6 years of Instagram, I’ve found that the more hashtags I use, the more engagement I get, and that makes sense, as the more hashtags I use, the more places my post will be showcased on. Moreover, you don’t only want to use broad hashtags like #tagsforlikes or #photooftheday, because these hashtags are known to be mainly used by spambots. And when you are looking to increase your engagement, you want to do so by attracting people who are relevant to your brand and post. And this ties back to the network principle which I talked about earlier. Therefore, only use hashtags as that are related to your brand and niche. When searching for hashtags, Instagram has a suggested page at the top where you can get inspiration and suggestions for hashtags that you can use that are relevant to you. In every single one of your posts, you want to add a location. And you want to do this to increase your engagement. Because apart from your hashtags, by adding a location, you have yet another place where your post will be showcased, thus granting you more engagement. In fact, posts with a tagged location result in 79% higher engagement than posts without a tagged location. That’s quite a significant number, yet a very simple thing to do. Your first goal is to get your post in front of your audience, but what you ultimately want is that they engage with your post. Because only then will Instagram get a hint that people seem to be liking that post and finding it relevant, and ultimately showing it on the Instagram explore page. And a simple approach to getting a higher engagement is by adding a call-to-action to your posts where you encourage your audience to take action. You should also remember that your caption is not only a place to add call-to-actions, but it is also an important part of a successful post, as it helps give content to it. Therefore, your captions aren’t something you should neglect. And while the visual content you share is undoubtedly the most important part of a successful Instagram post, considering the fact that Instagram is a visually driven platform, captions still do matter, and can increase your post’s engagement. To get your audience to engage, write simple calls to actions that don’t demand too much from your audience. For instance, if you want people to comment, don’t ask them to write their life history, because few will actually do it. Instead, you can ask simple questions like yes/no, or ask them to choose between one or the other. Moreover, you also want to have in mind that the caption of your post is the first introduction to your brand that people will have once your post gets featured on the Explore page. Therefore, your caption can be the difference between them starting to follow you and check out your images – or look at it and continue scrolling. Also, your calls-to-action aren’t just dedicated to the existing audience that already follows you, but also the people who see your post on their explore page. If you have a clear CTA, you can reel them in and get new people to start engaging with you – giving you an opportunity to continue the conversation with them. If you go to your explore page on Instagram, you’ll see stories circles at the very top. There, stories that have been shared using the location you’re in, as well as explore page-worthy stories, together with live streams are features. For instance, if I am in New York, I’ll see a story circle on my explore page saying ”New York”, where stories that have been shared using that specific location will be featured. While this won’t grant you the same exposure as getting a post featured on the page, creating stories with locations can still gain you quite some exposure. And if you’re sharing stories in a city where not a lot of content is being created and shared, the chances of getting showcased is very high. The same principle goes for live videos and sharing stories without a location, however, getting on top posts with those may or may not be harder, depending on the competition. And if you want to get people to do something for you, you know that incentivizing them to do it is the single most effective way. Because if people feel like they’re getting something, they’ll be much more likely to do it. There are tons of different ways you can do this on, but one of the most popular ways is obviously running a giveaway where people have to engage with your post in order to enter. And if you’ve run a content of this type earlier, you know just how much this can skyrocket the engagement of that post. Let’s say you’re running a giveaway. Ask your audience to comment why they should win, or give you the answer to a tricky question. And remember, the better the price is, the more people will be willing to do it. Instagram is a social media platform. And remember that it is called social media for a reason. And the truth is, by being social, and engaging with your audience and building your relationships, you make your audience more loyal to your brand and posts. This means, that when you share something, they’re much more likely to engage with it. They’re also much more likely to comment and share their thoughts because they know you’ll respond. It’s no fun to talk to someone that doesn’t respond, right? Therefore, you need to put great emphasis on engaging with your audience, as this ultimately will increase the engagement of your posts. Respond to each and every comment you receive, like your followers’ posts, comment on them, and try to strengthen your relationship with them. Engagement groups have been quite discussed as to whether or not they’re ”ethical” or not, as you have a bunch of people engaging with your post and ”faking” your engagement. An engagement group is a group of accounts in Instagram Direct Message which engaged with each other’s posts. For instance, if I share a post, I let the people in the group know about it, and then they go and engage with it. Doing this can significantly increase your engagement, especially if you’re in a group of accounts with a large audience, because of the network principle. Some argue that this is inauthentic because the engagement itself isn’t authentic, however, others argue that it is just groups of people who genuinely like each other’s posts, and the engagement group just ensures that they aren’t missing out on posts that they’ll find appealing and interesting. 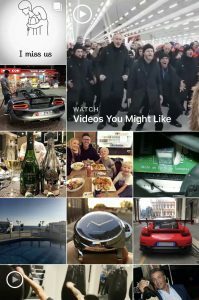 As you know by now, the foundation for getting on the Instagram explore page is tremendous engagement and having people show a great interest in your posts, indicating to Instagram’s algorithm that people find it interesting and thus that it is worthy of a first-row spot on the Instagram explore page. As such, you want to use every method you can to attract eyeballs to your posts, and one of those methods which I haven’t talked about is tagging people in your posts. You can tag up to 20 users in your posts, and when you do, they’ll get a notification and most likely also check it out. Many will even engage with it. As for choosing tagging people to post, begin with people you’ve built relationships with within your industry. Just tagging random people isn’t the ideal strategy since some will get confused and wonder why you tag them in their post, so focus on people you know and people in your industry. Engagement is important, but fast engagement is even ore important – both for Instagram’s feed algorithm and for the Explore page algorithm. Another way to increase your engagement and make sure that you receive it quickly is to ask people to turn on post notifications for your account. What this means is that when you share a post, they’ll get notified of if, and thus become more likely to become curious and want to check out the post you just shared. There are a number of ways you can go about increasing your chances to get to the Instagram explore page, but the methods won’t guarantee anything since it is Instagram’s algorithm which has the final word. When you do get featured on the Instagram explore page, you get a tremendous exposure and can see an enormous increase in engagement and interest in your post and page. With these methods, you significantly increase the chances to get to the explore page, so make sure you work actively with them and you’ll end up on the explore page before you know it.